The Disk II floppy drive was anything but a flop for Apple. 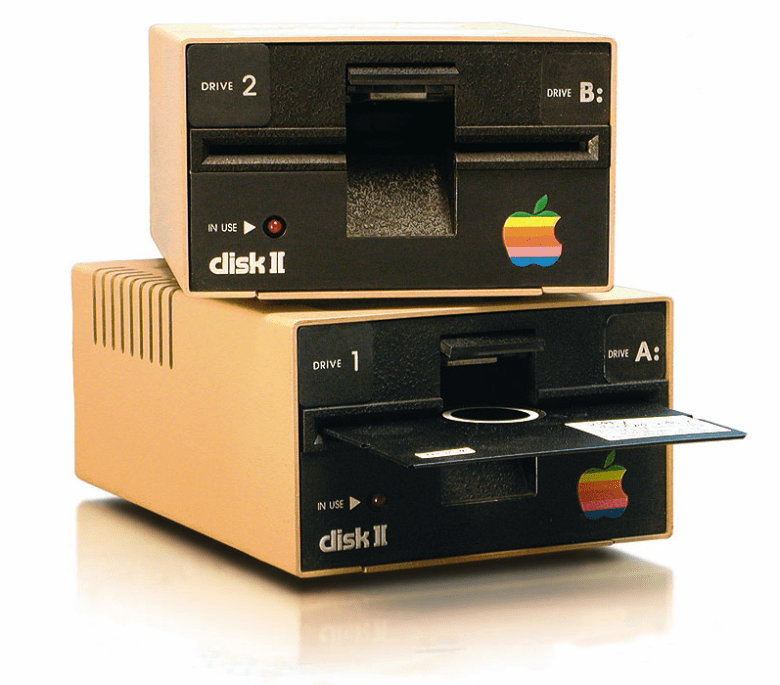 June 1, 1978: Apple launches the Disk II floppy drive, one of the company’s most important peripherals ever. The best floppy drive available at the time, Disk II solves the Apple II’s most glaring weakness — a lack of storage. It also helps establish Apple’s flair for handsome profit margins. The Apple II had been available for around six months when the need for a better storage option became obvious. In today’s world of cloud storage and 256GB mobile devices, it’s strange to consider a time when storage space was at a severe shortage on Apple machines. That certainly proved the case in 1977, however. At that time, the only way for users to store and access programs and data was using unfathomably slow cassette tapes. The floppy disk provided a new solution. IBM invented the 8-inch floppy in the early 1970s. Shugart Associates later shrank it to 5 1/4 inches, a size more appropriate for personal computers. The 5 1/4-inch floppy disk debuted in 1976, making it cutting-edge technology when it arrived on the Apple II. Apple’s first investor and (later) second CEO Mike Markkula recommended that Steve Wozniak build a disk drive for the Apple II. His rationale? Giving users an easier way to store and access program would make the computer far more compelling to customers. At the time, many people remained unsure why they needed a computer in their home. As Wozniak recalled in his autobiography iWoz, the Apple co-founder wanted to attend the Consumer Electronics Show in Las Vegas. However, he was told that only Apple marketing people were attending. “I asked Mike, if I finished the disk drive in time, could I go to Vegas for the show?” Woz recalled. Markkula agreed. Woz later described the Apple floppy as the finest piece of engineering he ever engaged in. Wiggington enjoyed the challenge, too. They got to Las Vegas and, after a last-minute hiccup in which they accidentally wiped the demo disk while attempting to create a backup, the CES debut worked perfectly. When it launched in June, the Disk II became a big hit for Apple, helping drive sales of the Apple II as Markkula hoped. It arrived around the same time as Apple DOS, Apple’s first official operating system. The Disk II proved significant in two more ways. First, it became obscenely profitable for the company and helped establish the high-profit-margin strategy continues to this day. Using only $140 in components, Apple manufactured a disk drive that sold for $495 during preorders. (It cost $595 if bought later.) Even at that price, the Disk II was the most-affordable floppy disk drive sold by a computer company. The second reason the Disk II was important is because it marked the end of an era at Apple. Like the Apple-1 and Apple II computers, this was a device predominantly designed by Woz, with only a team of two responsible for it. Afterward, Apple moved to a more committee-driven approach to its tech. Initially, this hurt the company, resulting in the disastrous Apple III. Apple went on to produce six variants of the Disk II concept over the course of the Apple II’s lifetime: the Disk II, the Disk III, the DuoDisk, the Disk IIc, the UniDisk 5.25 and the Apple 5.25 Drive. Some version of a floppy disk drive continued to ship with Apple computers right up to the iMac G3 in 1998. Do you remember the Disk II? Leave your comments below.